Thanksgiving is just a few days away – I am so excited! A holiday that revolves all around food, family, giving thanks and Mexican Train Dominoes. Sometimes, however, bringing food that everyone will love to either Thanksgiving, Christmas, New Years, etc. can be a bit stressful, intimidating and time consuming. Stress no more. 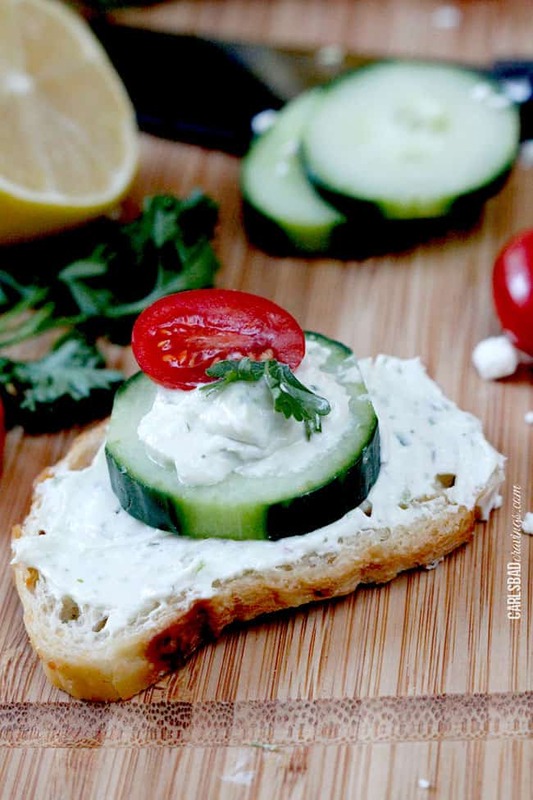 I’ve alleviated all three stressors with this quick, easy, and fool proof – 7 Minute Garlic Jalapeno Whipped Feta. 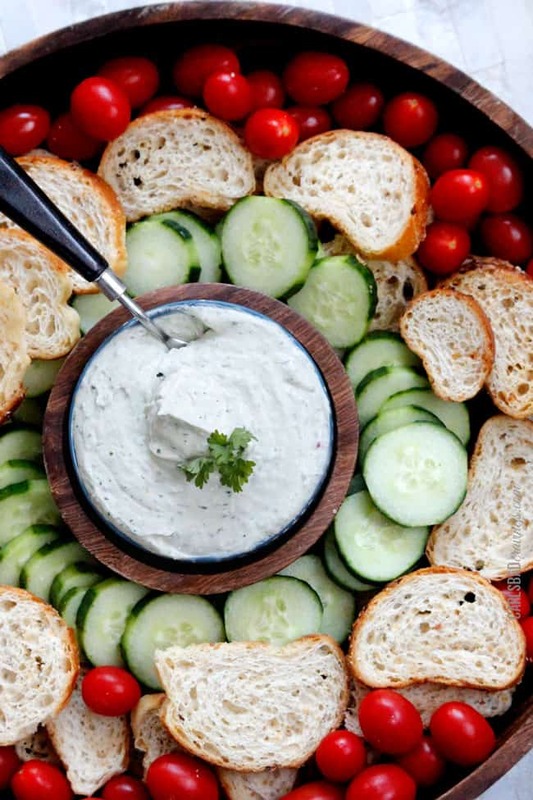 I mean, really, what could possibly be better than creamy feta?! 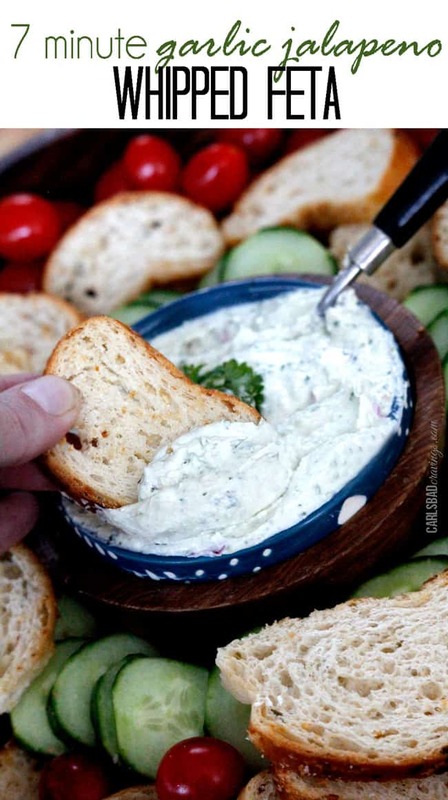 Possibly only creamy feta with cream cheese, jalapeno, garlic, fresh basil, fresh parsley and red onion. Creamy, tangy, flavorful and as much heat as you would like. But, it is also super adaptable. 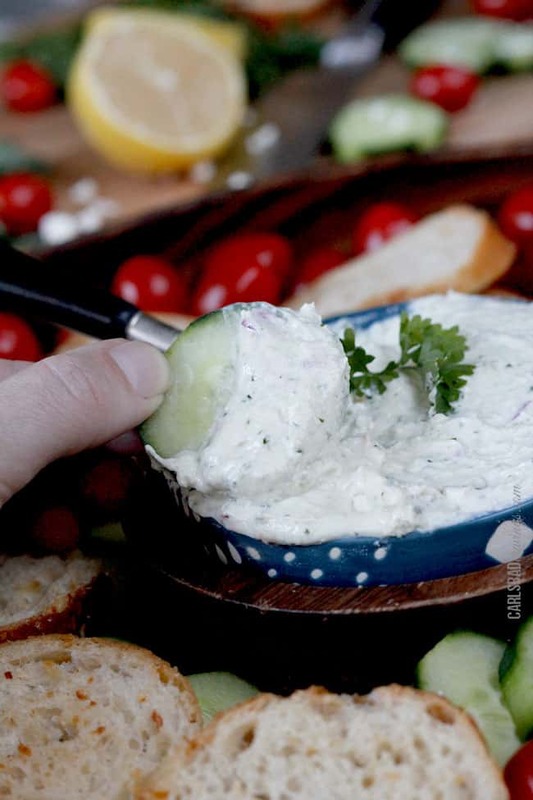 You can start with a base of whipped feta and virtually add anything that suits your mood. And besides being an addicting appetizer, it is also a tantalizing, velvety spread on chicken – like my Balsamic Whipped Feta Bruschetta Chicken, coming soon. Be excited, be very excited! 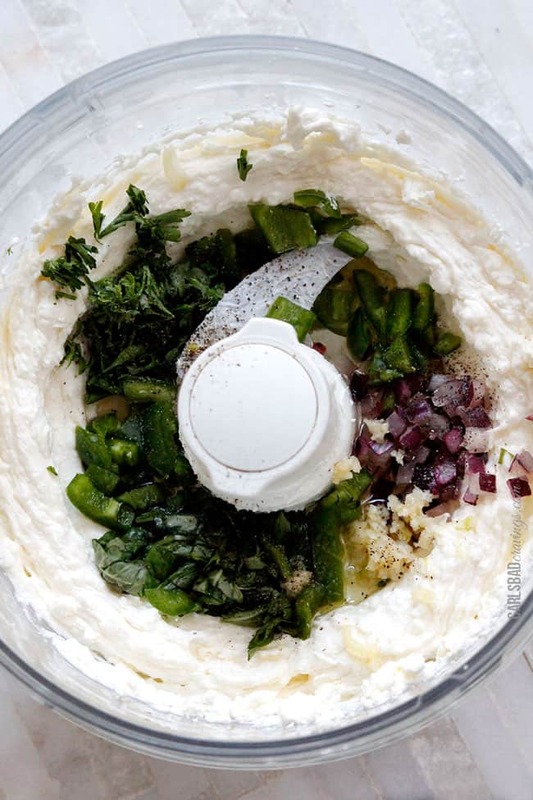 And that easy part I mentioned- a nice relief from the hustle and bustle of holidays – it goes like this: Add cream cheese and feta to your food processor and mix until creamy. Add remaining ingredients and mix until chopped and smooth. Eat! That might also just take 7 minutes. 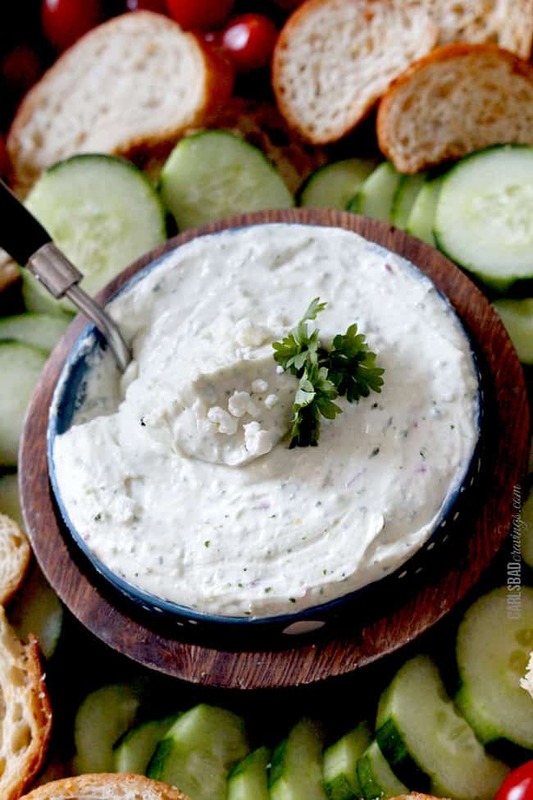 Or delectable spread that you will find all sorts of excuses to slather on anything because the end goal is for this whipped feta to enter your mouth. 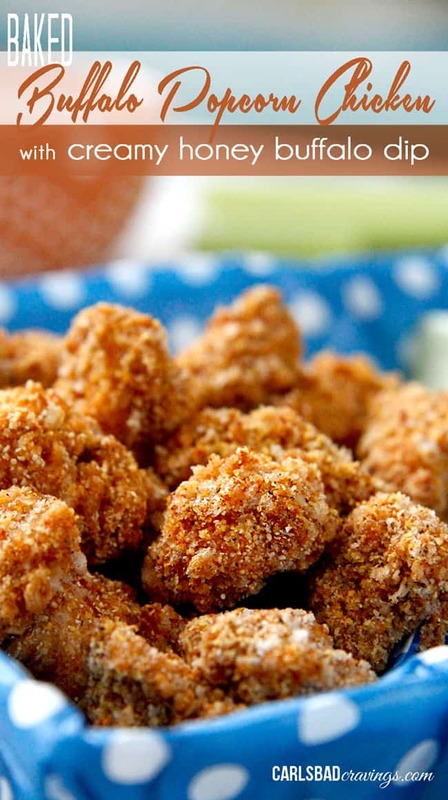 It also can make a pretty appetizer – if you have the self control to wait. 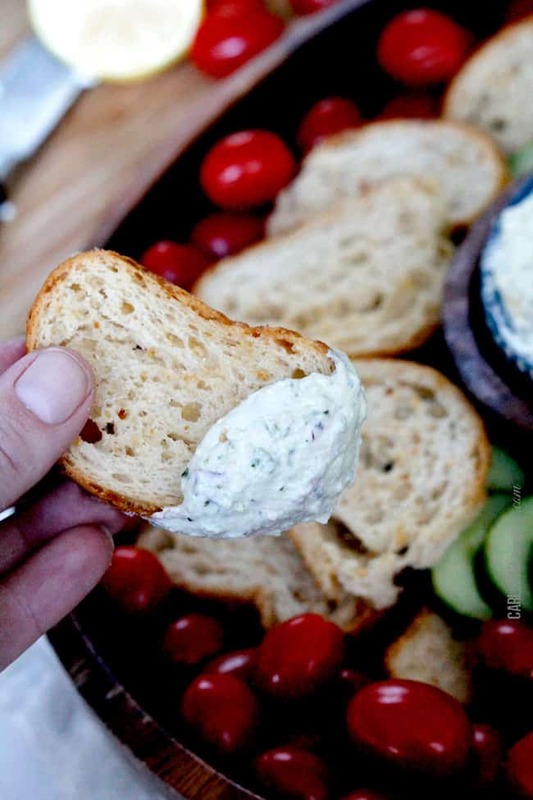 No stress, fool proof 7 Minute Garlic Jalapeno Whipped Feta. One of my gifts to you this holiday season. Happy Holidays! 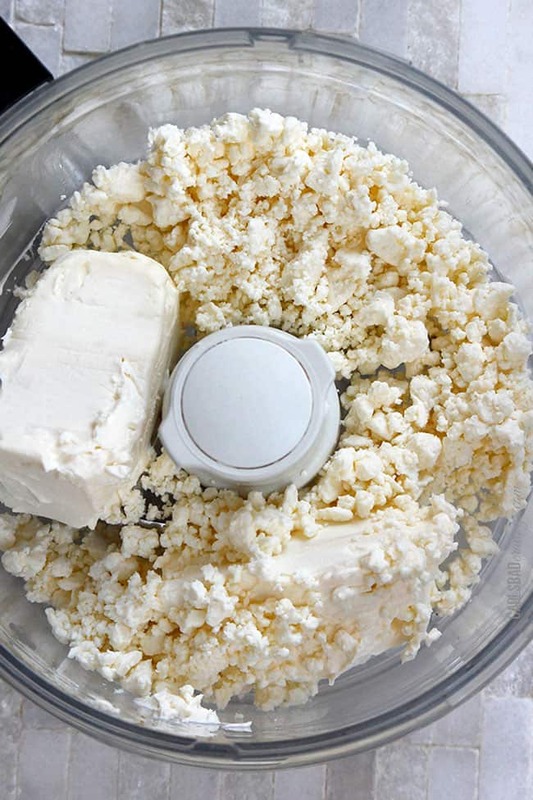 Add feta and cream cheese to food processor and pulse until cheeses are mixed. Continue to mix 3-4 minutes until cheeses are very smooth. Add remaining ingredients and pulse until smooth. Season with salt and pepper to taste. 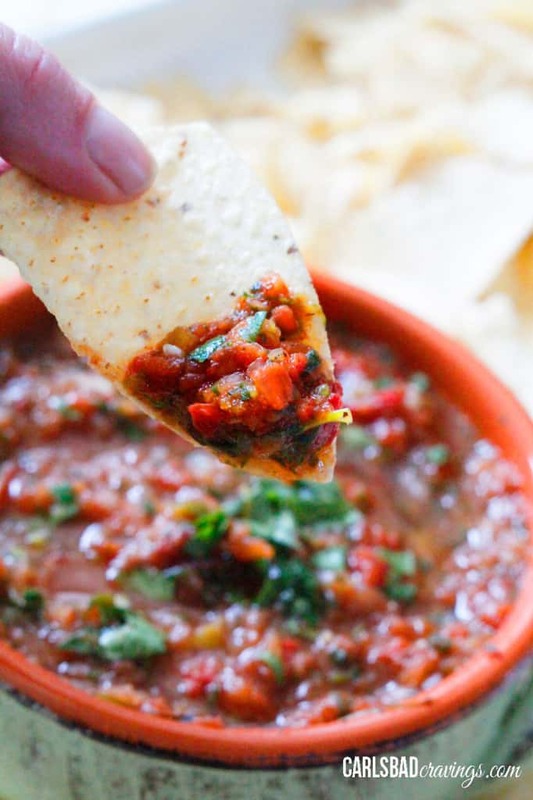 If you like a spicier dip, add hot sauce or some of the jalapeno seeds. Serve room temperature or warmed for spread/dips for chips, crackers, bread, etc. I like my dip chilled if serving as dip with vegetables, The dip firms up slightly when refrigerated so just soften in the microwave for 30 seconds or so before serving. 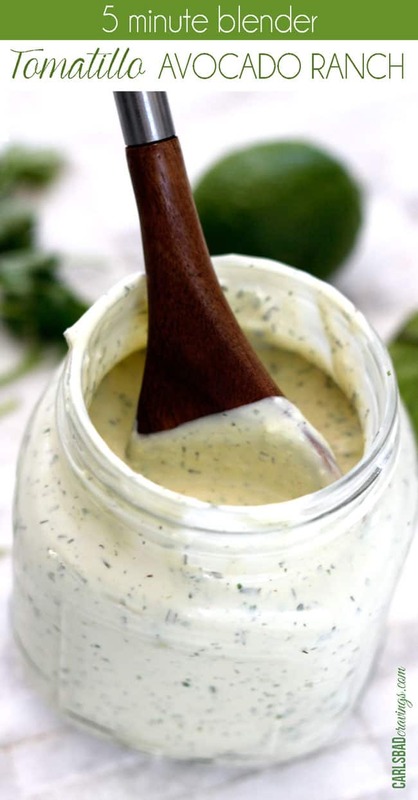 *This dip/spread can be prepared days in advance then microwaved to soften as it firms up when refrigerated. I saw this on Pinterest and had to stop by to say how fantastic it looks. It’ll be on my appetizer menu for my next holiday gathering for sure. 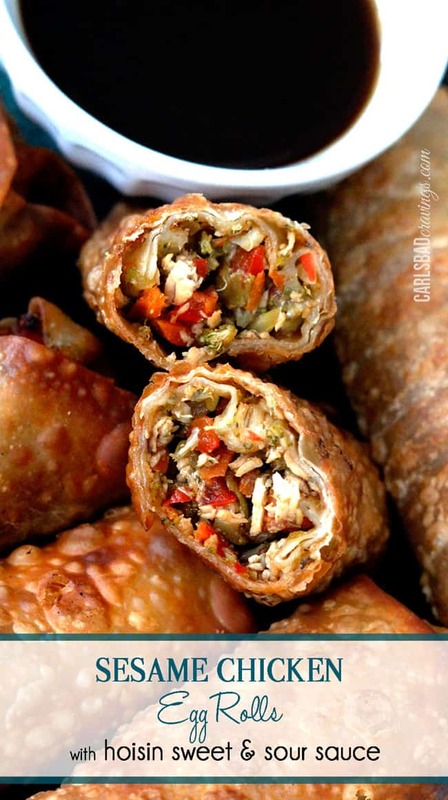 Can i make this tonight and refrigerate and serve next day? Hi Amy, Sorry I was away from my computer all night so I am just seeing your question – sorry I’m sure its too late to do you any good but yes, you can make this tonight and serve it the next day. It firms up when refrigerated so you would just have to microwave it a little to soften. Enjoy! I pinned this recipe a while ago, and just made it today for an office potluck. It was gone in minutes, and everyone asked me for the recipe! I doubled the parsley, and the dip turned a pretty shade of light green. I served it with sliced cucumbers, baby carrots, and toasted French bread. Next time I’ll try toasted pita triangles. Thanks for a great recipe! You are so welcome! I thrilled it was such a hint! By doubling the parsley, it could be served for a St. Patrick’s Day green appetizer:) Thanks so much for commenting Kristen! Have a great weekend! In the picture it looks like way more feta then 3 OZ? Just curious did you add more to taste? 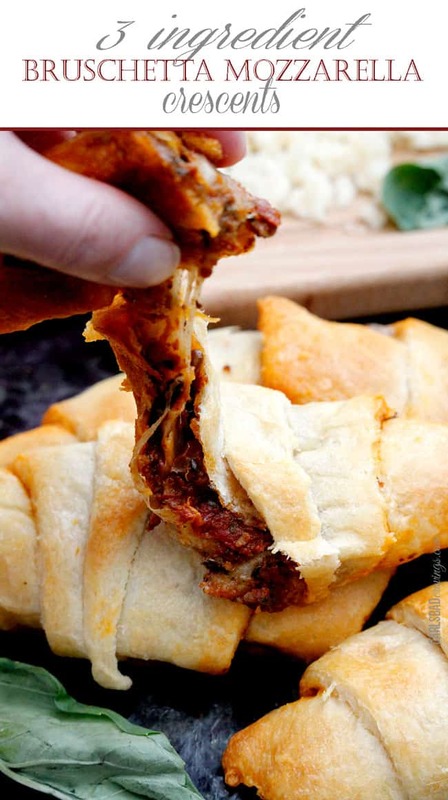 I made this for a football party and I am making it again for Thanksgiving dinner. SO GOOD! Awesome Morgan! 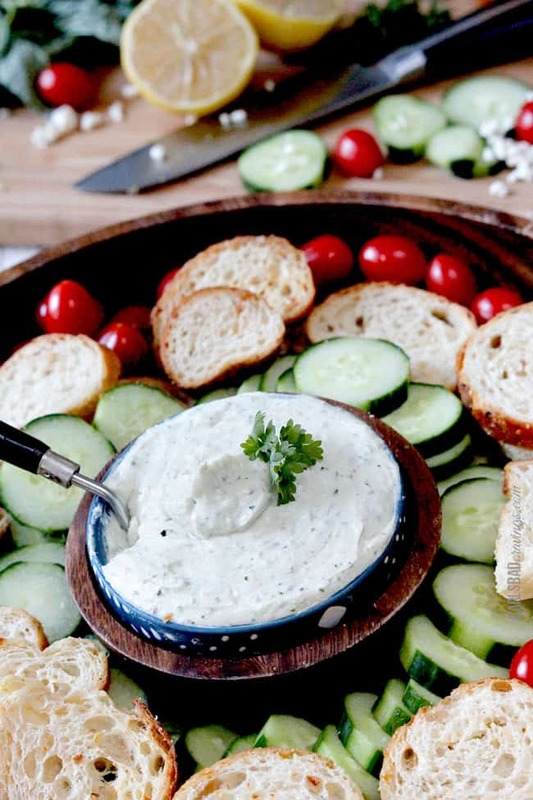 I’m so happy you love this dip so much! Happy Thanksgiving! Can you make this without a food processor? Hi Sarah, you could try chopping all your ingredients by hand and using a hand mixer instead. I haven’t tried it, but it could work. Good luck! 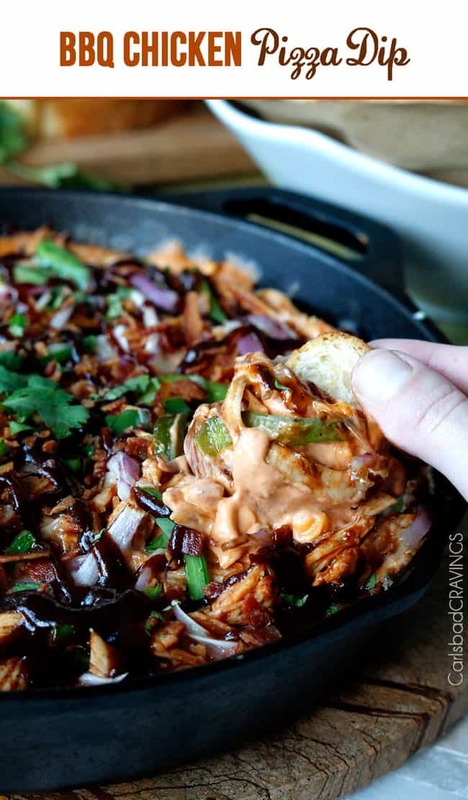 Did you ever post your recipes for balsamic whipped feta Bruschetta Chicken that you mentioned in this post?